As previously mentioned, automated archiving is managed by automated jobs that are configured on the job’s configuration page. Here you can define the exact configurations (i.e. database, schedulers, storage, address book objects to process etc.) of an archive/restore/recovery/mailbox move/shortcut synchronization/shortcut repair job. Navigate to Email archive -> Archive on the ribbon and click on the Jobs button. The Jobs page of Email Archive will open. Click here on + new option. 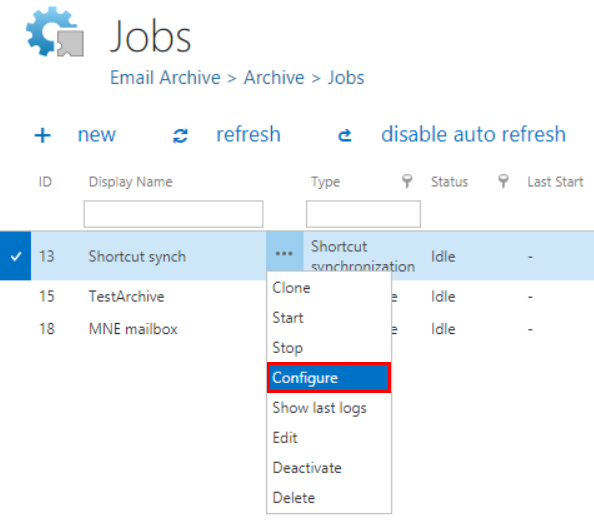 In the Add new job instance dialog choose one from the list of available jobs (Email archive/Email restore/Email recovery/Mailbox move/Shortcut synchronization/Shortcut repair), select the node where the job will run (option Run on node) and fill a Display name into the Add new job instance popup-window. Then click on Add. If you want to configure the job immediately, then click OK in the pop-up window and the job configuration page opens immediately. The configuration page is accessible any time using the “Configure” menu item in the given job’s context menu (2nd picture below).